We woke to rain on Friday morning in Oakdale Campground and decided we’d give it a couple of hours to see what the weather would do over the morning hours. If it continued raining we would stay for another day and head out on Saturday, if it stopped we would head out Friday. Along our travels in Ohio after leaving Oakdale Campground in Quincy. About 9 am it stopped and we finished hooking up and headed out. It took us about 30 minutes to get out of the campground and we didn’t dump as we missed the turn and there was no where else to turn around and go back without wasting another half hour. We opted to find a dump station elsewhere. 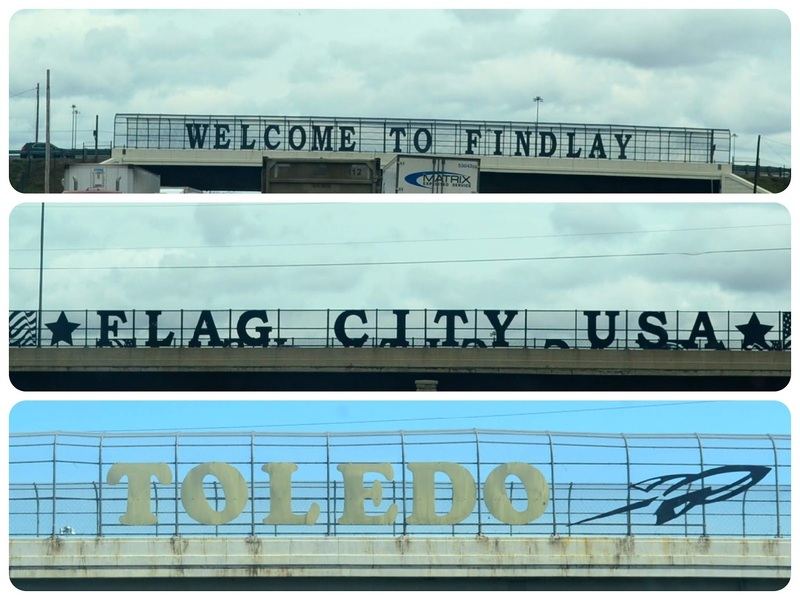 Flag City and Findlay are the same city. We were on the actual road, not just getting to it by 10 am with another destination in mind. Beaverdam and the Flying J with a dump station. About an hour’s drive from the campground and about half way through out travel day. We were happy to be on our way further north and closer to home. The roads were a bit damp but we had no issues. The way to the interstate is never straight forward but windy, twisty and skinny back roads, turn right, go straight, turn right, go straight, you know the way the GPS takes you. We eventually ended up on I-75 Northbound. Bonus, we were going the right way too!!! That is the Motor City ahead of us this morning. A stop at the Flying J in Beaverdam, Ohio had us spending $10 to dump our tanks. No complaints, easy in, easy out. Huge parking lot in the back for future places to stay if necessary. The sky was clearing a bit and it was warm, very nice and warm. Not hot but certainly nice spring weather. Within the hour we reached our changed destination. We had been planning on the Walmart at Perrysburg, a suburb of Toledo but opted instead for Bowling Green. 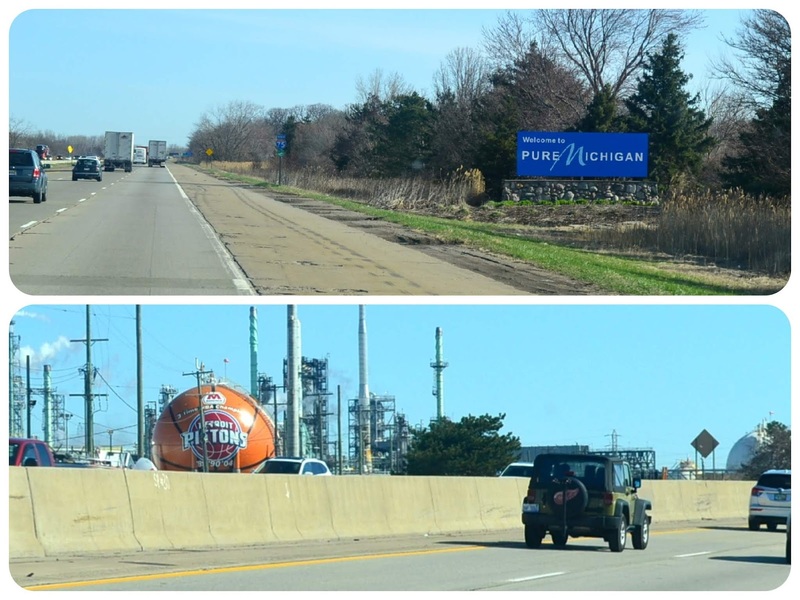 Only a few miles short of Perrysburg. Easy to find, easy to park, not the most level place (again not a complaint just a reminder for the future) but still lots of room or so we thought. The reefer truck beside us all night could have parked in another spot but chose right beside us instead. He arrived in time to have multiple choices, and he chose us. Oh well, it’s only one night. 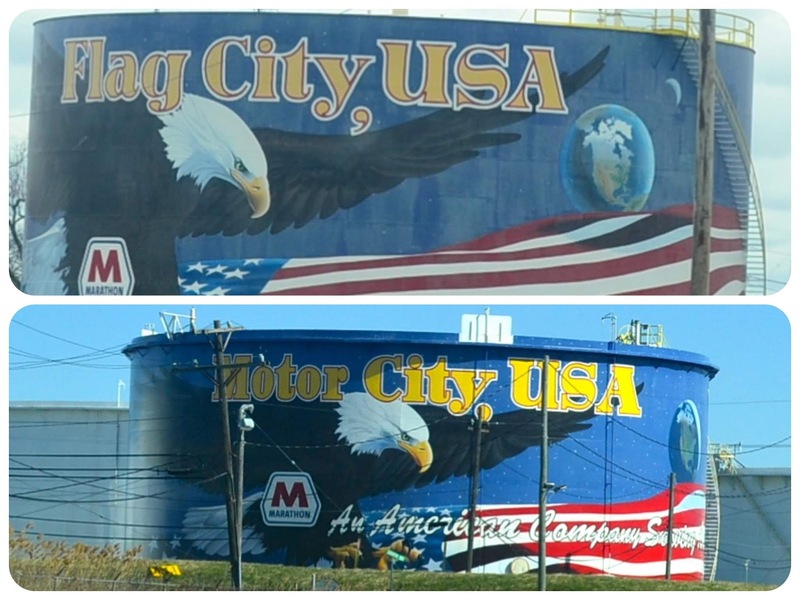 Michigan is home to Detroit which is home to the Pistons Basketball team. After unhooking to fuel up which took more time to hook and unhook than fueling took, we were on the road once again around the 8:30 am mark heading north on I-75 and the border crossing. The first part of I-75 is brutal and should be closed until it’s repaired before someone hurts themselves trying to dodge holes. However it was short lived, and before long the roads were much better with only the occasional hump or hole. 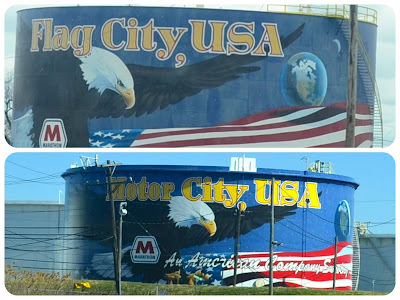 Different states but the same painting. Very patriotic. 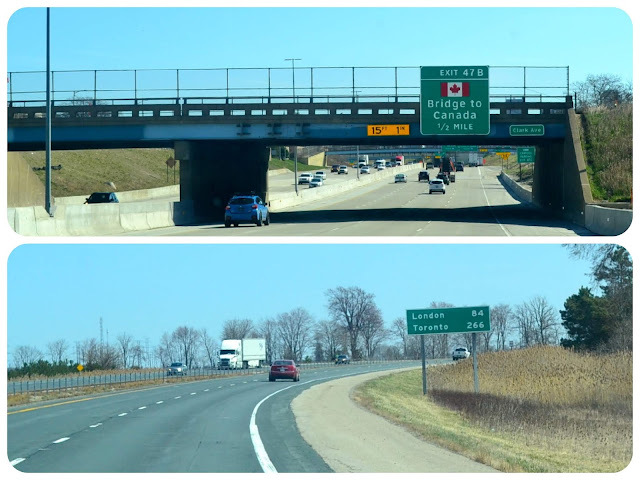 We easily found our way to the ‘ ridge to Canada' exit, and before long we were crossing the St. Clair River after paying our $10 US fee to cross. A bit of construction on the bridge but nothing too major and soon we were in line for customs. Not many in line ahead of us but the guard was taking his time and we waited about 20 minutes to reach our turn. A few questions and we were off to find the 401 East to London. The exiting of the customs area was like driving in Michigan, and we as Ontarian’s should be ashamed of ourselves for letting that particular two car lengths of road get like that. A person could lose a small car in one of those holes and not ever find it again. Crossing the Ambassador Bridge from Detroit, MI to Windsor, Ontario. We pass over the St. Clair River. We motored right along on the 401 Eastbound enjoying the sights and the smells of being back home. Our destination was the Dutton OnRoute but after stopping for a Timmie’s we headed back on down the road to Woodstock, just a mere 45 minutes from tomorrow’s destination. Forecast is calling for rain and I don’t want to drive far in the rain so this a much better stop. Not a big lot here but we’re settled in nicely and are looking forward to reaching Bradey & David’s tomorrow. Of course some text messages to family letting them know we arrived back in Ontario and a call to dad were also part of the ‘home’ experience. We are taking that exit. Going past London but as far as Toronto yet. Those are kilometers on the sign, not miles. Thanks for stopping by, I hope you enjoyed your visit. I’ll be posting every couple of days for a while as things will be a bit busy. They let us back in again!!!! Nice to see you two made it back safely again. Sure know what you mean by those absolutely terrible roads. Always a good feeling to cross that border back into Canada. As much as we love the States it is always such a relief to be back home again. Thanks Al. We are happy to be back. A nice feeling even though we also enjoy our visits south of the border. Looking forward to warmer weather and some sunny days!! Know what you mean about crossing the Detroit River and being faced with the terrible condition of Huron Church Road. Missed yesterday's blog or we could have had a coffee at the Husky. Be Safe and Enjoy being Home. That short stretch of road is horrendous, no way to get around it either. By the time we are reaching the border crossing we are mostly just in a hurry to get closer to family and so stop very little, if at all. Welcome back to Canada .That Walmart is handy for us here as well, just for shopping though pretty close to where we are, Now Enjoy visiting today and keep warm, should warm up soon. Thanks George. We're happy to be home in Ontario. Still a while before we actually get to our summer location but it's nice all the same. It was a nice stop for us. We are looking forward to the warmth. Welcome home, glad that you made it safely. Now for some nice visits and catching up with friends and family before that final push to the big island and home. Take care and continued safe travels. Thanks Bill. It's nice to be back and we are looking forward to the visits as well. Always nice to see those we love. Welcome Home! Yay! I think all of our Canadian friends who wintered south are home now. Thanks Patsy. We are happy to be home and I think only Lorne & Sue may be left in the US. Although by this time they may be home as well. We are enjoying the time with family for certain. Their busy work schedules make the visits short and sweet but still good. Dad is happy but will be happier when we are tucked back in our summer spot I think. Welcome back home. Enjoy your summer and say hi to Riley for me. Thanks Doug. We missed your smiling face this winter. We hope it was a good winter for you and yours. Glad to read you made it back into Canada safely. I would bet your Dad was glad to hear the news. Enjoy your family time and continued safe travels as you make your way to your summer place. Take care. Thanks Deb. It's nice to be back in Ontario and we are enjoying the visits with family. Short and sweet but still very nice. Dad is happy we are back but will be happier still when we park the Igloo in our little spot on the hill top in a few weeks. My daughter Riley travels with me. Riley has learning disabilities and struggles with a number of issues. The travel is helping her start the long slow process of overcoming some of these issues. Forward progress is wonderful but not an every day occurrence, nor is it an every week occurrence. A smile on her face tells me we're making progress, no matter how slight. At the end of the day, that's all that matters. Meet the Dogsled (2014 Chevy Diesel 2500 4 x 4) and the Igloo (2011 Keystone Cougar, 2 bedroom, bath and a half, 3 slides all in 34ft.